New Tech: Meet Challenges With The New 58TP Programmable Thru-Bore Encoder! 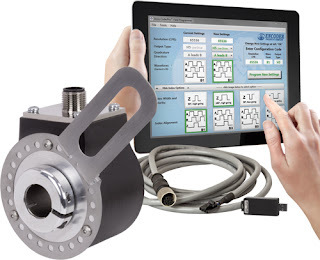 Meet Challenges With The New 58TP Programmable Thru-Bore Encoder! Encoder Products Company (EPC) has now introduced a new 58 mm, thru-bore, programmable encoder, the Model 58TP. The 58TP is specifically designed for the challenges of an industrial environment. In addition to its rugged, industrial housing, the Model 58TP offers an advanced set of electronics that allow the encoder to be programmed for exact application needs. Users may choose from 6 output types, 32 different waveforms, and program any resolution from 1 to 65,536 CPR. These programming features allow a single encoder to be configured for multiple applications, enabling one encoder to replace many different part numbers, and provided cost savings on inventory and down-time replacement. For questions, or for more information, please contact C&E at 800-228-2790. Thank you!